The most divisive item on the ballot this election season in the rural village of Mount Horeb isn't about candidates. It’s about dogs. 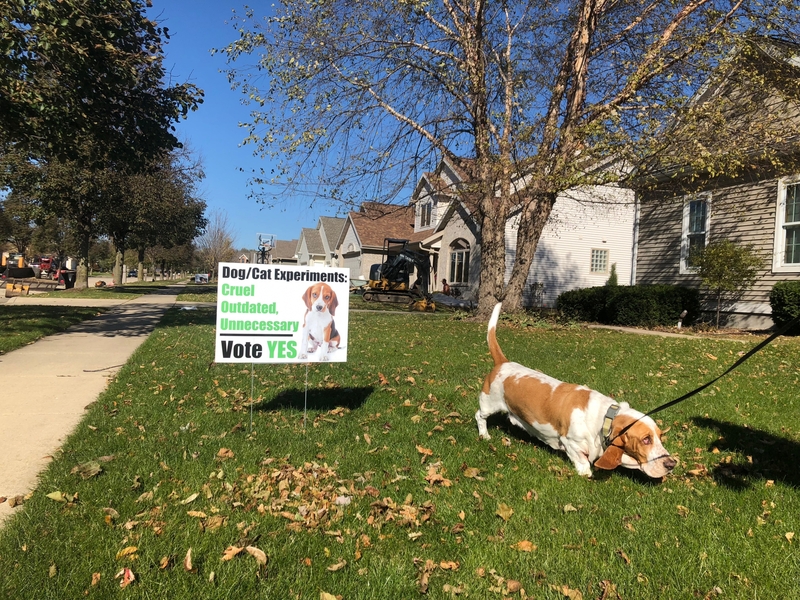 Residents will soon vote on whether to designate places that breed, sell, or use dogs or cats in research as a public nuisance, and the issue has divided the village. Just over two weeks before the election, Jill Swekel is outside with her dog, Reggie, at their home in the village of Mount Horeb. He’s a basset hound: sweet and slobbery. "He’s not all that smart in the department of what he puts in his mouth," Swekel says with a laugh. There's a sign on Swekel's front lawn with a picture of a beagle that kind of looks like Reggie. "It says, 'I am not a science experiment,'" says Swekel, reading the green text that stands out on the sign's white background. Next door, there's a sign showing a smiling woman hugging a black puppy. It says, "Animal research saves lives." Swekel and her neighbor represent the two sides in Mount Horeb's binding referendum. The target is Ridglan Farms, a beagle breeding and research facility. If the referendum passes, places like Ridglan would become a public nuisance, like gambling devices or illegal drinking. Although the referendum is binding, the vote is largely symbolic. Ridglan has a post office box in Mount Horeb, but the farm, where the dogs live, is in the next village over in Blue Mounds. A local activist group called Dane4Dogs started collecting signatures this summer. They had more than 650 Mount Horeb residents sign their petition, certified by Village Clerk Alyssa Gross. 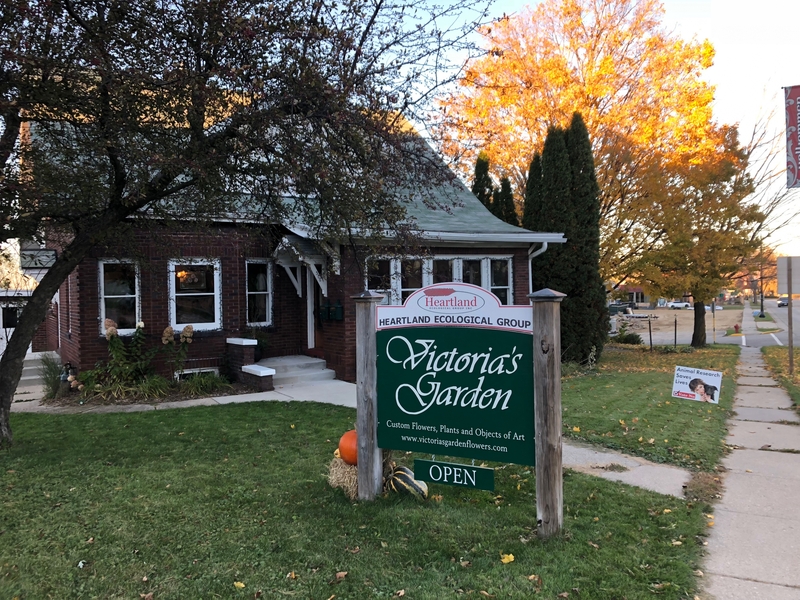 Rather than simply accepting the direct legislation after enough signatures were gathered, the village board decided to put the question to a village-wide vote. Mount Horeb has been divided ever since Dane4Dogs began campaigning. There are signs on front lawns and billboards on the highways, all in a village of fewer than 7,500 people. For residents like Swekel, the issue is straightforward. "I just don’t believe that we should be breeding animals in the thousands that should be sent to experiments that really are antiquated and outdated," Swekel said. But it’s a clear choice for those who will vote against the referendum, too, like Susan Wallitsch. "I'm a cancer survivor and about half my family have survived cancer," Wallitsch said. "And I very firmly believe that the science that we needed to get to the point where we could treat cancer successfully came in part from animal testing." Wallitsch has another reason for her vote: she’s friends with some of the owners. Through a spokesperson, Ridglan Farms confirmed it has four owners: Jim Burns, David Williams, Jeffrey Balmer and the estate of deceased Ralph McGrew. All four men are or were veterinarians, and several practiced in town, like Burns. "He's a veterinarian and has treated many, many, many of the animals in Mount Horeb over the years," Wallitsch said of Burns. "I absolutely believe that the animals are treated with care and with kindness and humanely." But Wallitsch also said the dogs at Ridglan have a purpose: "The purpose is so that we can develop treatments for diseases." Many of today's drugs and treatments have come, in part, from animal testing. But mice and rats make up about 95 percent of all animals used in research. Dogs and cats make up less than 1 percent. But dogs are still used to study diseases we have in common, like cancer. According to Ridglan, this research is essential. That's why they've mailed flyers to the whole village several times and bought ads in the weekly paper. Rick Van Domelen is the Ridglan Farms' facility manager and vet, and he's concerned that activists have a larger agenda. "Their goal is to end research worldwide essentially," Van Domelen said of the activists. "But they're going to start here." But activists like Samantha Robbins say Van Domelen is misrepresenting their campaign. "We're not saying animals in general we shouldn't test on them," Robbins said. "We're saying dogs and cats we see differently as a society now. We see them as family. So we're not OK with treating them this way." Tempers have flared over the issue and the tactics. Ridglan supporters believe local activists are coordinating with outside groups to shut down all research, and those activists think Ridglan is slinging mud to protect their profits. But what the referendum really comes down to, said Dane4Dogs founder Rebekah Klemm, are the 3,000 or so beagles at Ridglan. "Less than five miles away from where we're sitting right now, there are thousands of dogs in stacked cages in windowless sheds with no access to sunlight, no access to grass," Klemm said. She said those conditions are unethical, and that's what makes it a nuisance. Van Domelen couldn't disagree more. "Saving lives, human and animal, is not a public nuisance at all. Absolutely not," Van Domelen said. Van Domelen said the conditions in Ridglan exceed the standards required by the federal Animal Welfare Act. In an email from Ridglan’s spokesperson, the company acknowledged that the buildings do not have windows, and that, "In order to protect the dogs from disease, insects and injury, dogs are kept inside." Village residents will soon decide for themselves whom they agree with: Ridglan Farms or Dane4Dogs. But whatever happens in Mount Horeb, the activists say they'll get to work elsewhere in Dane County. How Did Dogs Become Dogs?